Everyone is playing the game of thrones, or of honor, or of some such, but while the characters we love to cheer, bemoan, or roll our eyes at, (that’s for you, Petyr Baelish,) are navigating hazardous personal challenges, a collective threat looms in the distance. Zombies descend from the frozen far North. These are not the staggering brain-eaters many of us fondly remember, however. Nor are they the more terrifying sped-up menace of more recent popularity. These are White Walkers and their reanimated army of Wights. 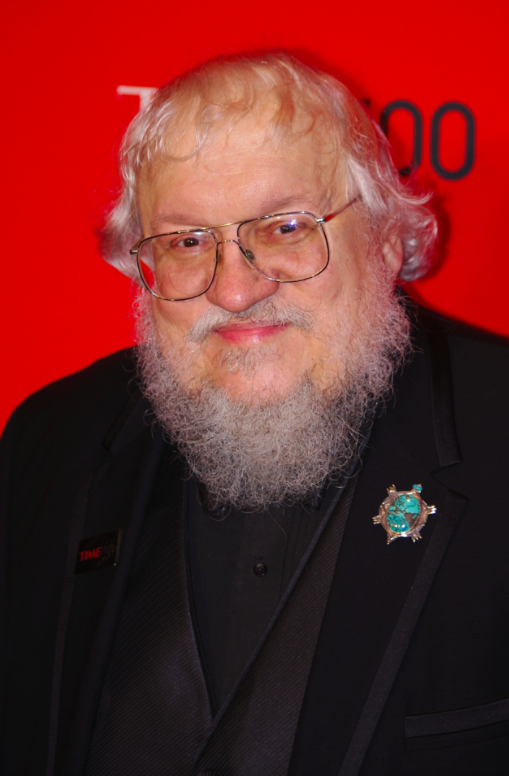 Due to its significant popularity, (GOT is the most popular HBO series to date,) let’s consider the story of Westerose as an expression of the collective unconscious of the Western world as expressed through the incredible vision of its author, George R. R. Martin. From this view, who are these chilling White Walkers and their army of zombie soldiers? You’ve probably thought about this symbolism, but when Season 4 ended it wasn’t a popular a topic of conversation. Not like Tywin Lannister’s scene on the wooden throne (He he he!) or Brienne and the Hound’s epic cliff edge battle (Bam! Pow!) or Prince Oberyn’s eyes-crushed-into-the-skull death (Disgusting!) so I’m blogging about it. Who are the White Walkers in this sense? Aren’t they the rising force of climate change and the fear that force evokes inside all of us, whether consciously or unconsciously? Aren’t they the bigger threat that will eclipse all personal drama for future generations, if not the youngest ones living? Through George R. R. Martin’s filter, the White Walkers and their ilk seem to me to be the collective threat that is presently emerging, so to speak, from the Earth’s actual ice. In this sense, they represent the polar ice caps that are melting at an alarmingly unexpected rate, decreasing the amount of reflective protection we get from the sun, causing sea levels to rise, contaminating fresh water, eroding coasts, and affecting weather patterns as well as species behavior patterns and food production. Along these lines, the White Walkers and Wights could be an expression of arctic amplification, a feedback loop that some scientists theorize may accelerate global warming to an un-reversible point. They could even be an expression of the dreaded methane burp – the hypothesis that a catastrophic amount of methane gas could be released into the atmosphere when the arctic permafrost melts. Though controversial, this theory is another ice-related horror that may best not be dismissed by the small privy council, especially in light of Dr. Jason Box’s research into rising methane spikes and mysterious craters above Siberia. These craters, Box believes, may be giant methane blow holes that will doom our kids to “a hothouse Earth,” …unless we act fast. Feel free to argue my point that Martin writes historical fiction with an underlying theme of climate change denial. Regardless, the White Walkers are the cohesive force of the story and George R. R. Martin’s greatest challenge. How will “The Song of Fire and Ice” end? Will the White Walkers ultimately be defeated or will it end like every zombie film, with everyone desperately fighting a lost cause? We know by now that the White Walkers can be destroyed with ancient technology. (Ooh! Climate change and ancient technology! I’ll resist going down that road, but I just couldn’t help saying, “Ooh!”) Since, to our knowledge, that technology is reduced to a buried bag of obsidian blades North of the Wall, let’s consider the other options. Stannis Baratheon can have an arsenal of Dragonglass blades FORGED at Dragonstone and delivered to the wall – IF the technology for forging them is discovered, and IF there is time to complete the task. The Wights, however, can be killed with fire, so unless the title is meant to mislead, (fire and ice, dragons and zombies,) Daenerys needs to be informed of the situation. Then she needs to fly her dragons to the Wall and help poor John Snow char those blue-eyed freaks to dust. So, what needs to happen for her to mount her beasts? Mount them?! Well, first she has to consider them for one freaking moment! First, she has to acknowledge that she has a little problem with her kids, and it’s here that we get to look at denial more specifically, a topic that I believe Martin excels at. Daenerys Stormborn of the House Targaryen is, as you know if you’re still reading, the Mother of Dragons, three to be precise – Viserion, Rhaegal and Drogon. She hatched them from rare, seemingly petrified eggs that she placed, (amidst much protest,) on her husband’s funeral pyre. This blaze was fueled in part by the screaming Mirri Maz Duur, the sorceress who most directly caused the infection that killed the Khaleesi’s Dothraki warlord. (I say “directly” because Daenarys also caused her husband’s death – indirectly through her overly-trusting idealism.) After making this offering to the flames, however, Daenerys walked into them herself having realized that it was she, (and not her turd-on-a-tuffet brother, Viserys,) who possessed the ‘Blood of the Dragon’ and who was, therefore, impervious to fire. 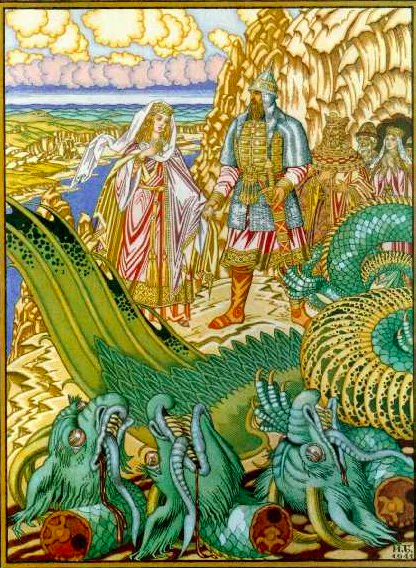 The following morning, the remnants of Daenerys’ khalasar awoke to find her not only unharmed but with three baby dragons crawling about her naked, ash-covered person, earning her awe, loyalty, and living legend status. With one exceedingly bold move, she had transformed herself from some doomed desert fate into an extraordinarily revered leader. At the end of the Season 4, however, we find that Daenerys has gotten herself and her followers into a quite a quandary. While en route to claiming her ancestral throne, she has gathered a large army by capturing the cities of Astapor, Yunkai, and Meereen and freeing the slaves therein. At Meereen, however, she learns that the previously freed cities have reverted to their old ways, so she vows to stay in Slaver’s Bay until she corrects her mistakes and learns to be an effective ruler. To her credit, she’s painfully aware of her lack of experience, but what of her three ginormous blind spots? Her dragons have grown large enough to eat whole cows, (not to mention children,) and yet she’s not focused on how to control them. Drogon is M.I.A. and Viserion and Rhaegal are chained in some underground chamber. In one of the season 5 trailers, “The Wheel,” we see her cautiously reaching out to touch her former champion, Drogon, but to no avail. As she turns on a marble balcony to watch him soar away, her gown gives her the appearance of an angel with wings. 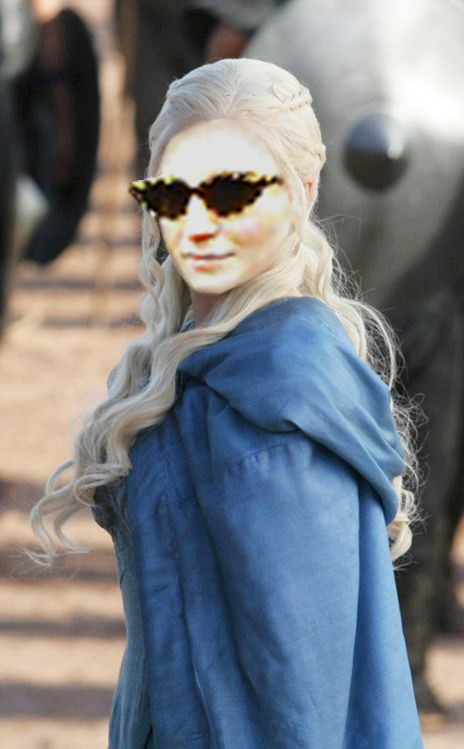 What happened to that fiercely confident woman who emerged in the Dothraki desert? The warrior who seized the power when she realized she’d been utterly betrayal by Mirra Maz Dur? The one who knew her own strengths and how to wield them without any need for counsel? Daenaryes’ instincts activated on that day when she became The Mother of Dragons. They leaped forth with a vengeance to save the quality of her life if not her life itself. We see them leap forth again in the House of the Undying when she regains her dragons after being betrayed again, this time by the Wizards of Quarth. We see that she’s connected to her gut instincts when she’s connected to her dragons, and his symbolism reveals both her inner conflict and its corresponding outer pattern – her idealism gets her into trouble and then her instincts get her out of it. Said another way, her idealistic self unconsciously creates opportunities for her to connect to her instinctual self. In that epic scene when we see Daenaryes take possession of the Unsullied, her instinctual and idealist selves are acting in a remarkable balance, but on the balcony in Meereen we see that her instincts have gone quite dormant again. She is in denial of her problem with her dragons because the part of her that can handle the situation is dormant. She is overextended and overwhelmed because she has idealistically taken on too much. Daenaryes is the universal mother. Her archetype is clearly, (though somewhat questionably,) portrayed when she’s being cheered by the adoring, newly-freed people of Meereen. But she’s idealistic to a fault when she isn’t grounded in her immediately realistic Earthly mother archetype. Idealism without realism is ultimately ineffective, so Daenaryes will fulfill her destiny when she finds her balance between the two. I, for one, relate a lot to this particular internal imbalance. That’s why you saw my head on Daenaryes’ body at the beginning of this post! It’s easy to see what someone else could do to turn their life around, and in this sense Game of Thrones is a wealth of material for self-reflection. Which character do you relate to the most? Not completely, of course, but in some defining way? Is it Daenaryes for you, too? Perhaps in the way I described? Or some other way? 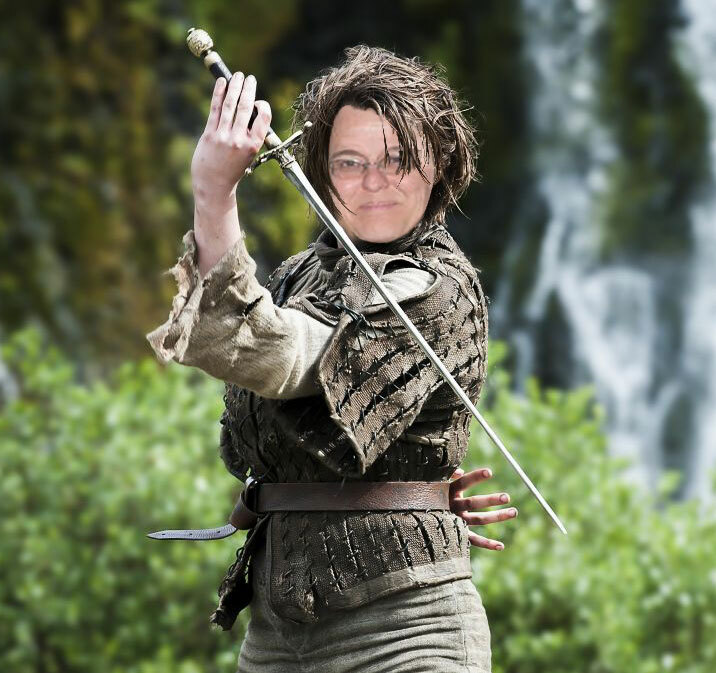 Or is it Arya? Tyrion? Sansa Stark? Or maybe the brooding Jon Snow? What is the pattern you see in this character’s behavior? What part of his or her personality is the obvious (or more subtle) saboteur? And what authentic part do you repeatedly see him or her deny? I would love to hear your thoughts. dearest Game of Thrones fans. You know who you are, so please share if you will. WHERE ARE YOUR DRAGONS?!!! 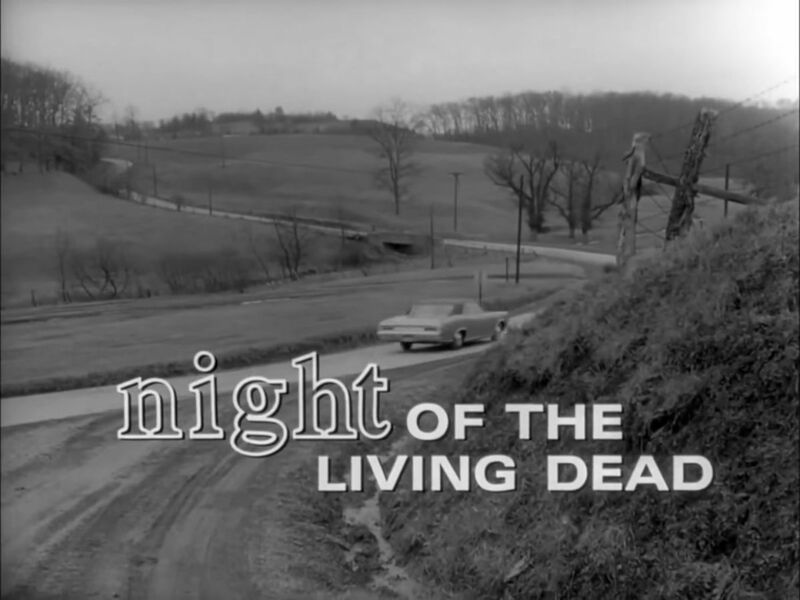 Title Card from George Romero’s Night of the Living Dead by Rowsdower45, Wikimedia Commons. George R R Martin 2011 by Shankbone, Wikimedia Commons. 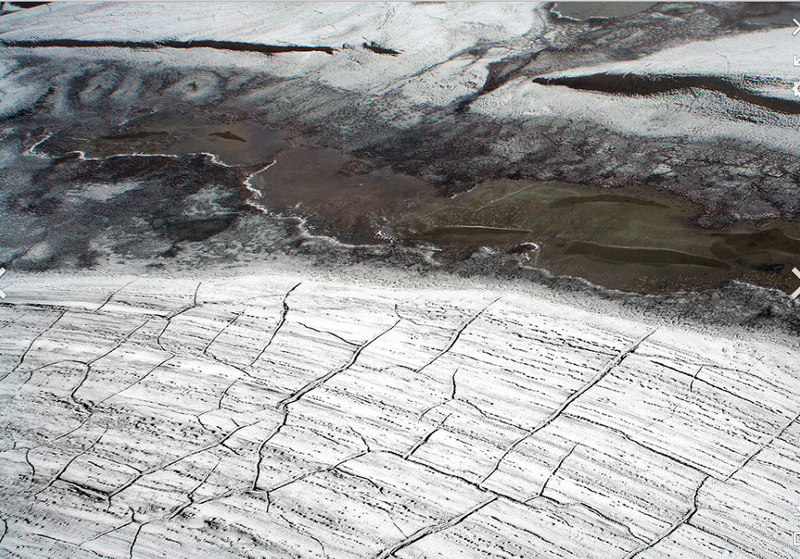 Permafrost Pattern by Brocken Inaglory, Wikimedia Commons. I agree with you that the icy undead symbolize much that is currently working against humanity. Namely denial as you stated, of past and current threats, the denial of the problem inhibits standing up to the monsters and creating a better reality. But, I will stop there, because I read the books. Did you read all the books?! You would LOVE them. Perhaps after your MA is completed? Congratulations!!! Wow! This is brilliant! I have seen Game of Thrones a couple of times. One of the times I saw an episode Daenaryes was sitting with her small three dragons. I was totally intrigued by her. 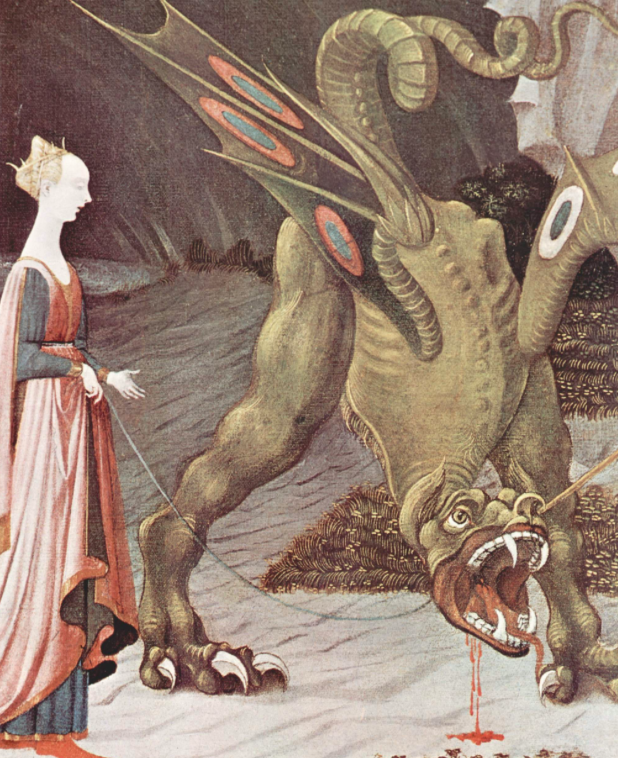 The person I was watching with stated “she seems to have good intentions but I am not sure.” This suggests that when you don’t deal with your dragons and connect to your instinctual self people may question you. I’m thinking the lesson here is that If you connect and trust yourself others can connect and trust you. I totally relate to Daenaryes! Thank you tremendously for analyzing and sharing ! Thank you, Linda. Great point! You’re intrigued by Daenaryes, too. Thank you for saying so! Emilia Clarke plays her so incredibly well. As Ena commented to me, you would love the books, too. Or the audio tapes. Because George R. R. Martin imagination runs so deep. And he is a genius with archetypes.